Would Day 2 of Move-In on Grand Canyon University’s main campus be as spirited as Day 1? The wild Sedona Hall scene Thursday morning provided a rather loud answer. You would have thought you were at a basketball game. In fact, the men’s and women’s basketball teams both were there — and things really got wild when Coach Dan Majerle and his players mugged for the television cameras. 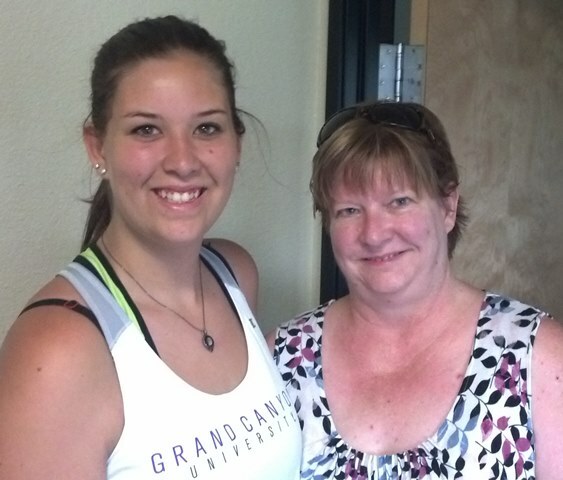 It was Move-In Madness, one of best recruiting tools GCU has, but with even more intensity. Volunteers jam-packed on the curb cheered wildly as each car drove in. Moms and dads took videos of the bedlam as they drove in and even jumped out to keep filming as the Luggage Luggers emptied vehicles in record time (more on that later). New students said they felt like celebrities as they were escorted to their rooms. 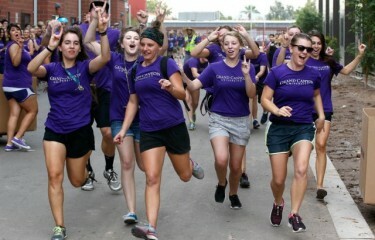 Everyone, it seemed, was smiling — especially Brian Mueller, GCU’s president and CEO, gazing at the hundreds of volunteers. Thankfully, the looming rain held off for most of the morning, and while the temperatures were about 10 degrees warmer than Wednesday, the clouds kept things semi-comfortable. Trent May, GCU’s women’s basketball coach, had his big hat ready, just in case. “Bald guys like me are just thankful that the sun isn’t beating down,” he said. The spirit just kept beating down instead. And that was music to everyone’s ears. Charles Robles plants a big one on his daughter Shelby as grandmother Janice Speaks and mom Glenda smile on. Army Staff Sgt. Charles Robles was on his second tour of duty in Iraq in 2009 when the military vehicle he was driving was struck by a roadside bomb. Robles, a father of two from Long Beach, Calif., sustained significant injuries requiring numerous surgeries, suffered a traumatic brain injury and returned home with post-traumatic stress disorder. Robles couldn’t have imagined that something good would come of his travails, but it did: His daughter Shelby was able to attend the college of her choice — GCU — because of a partial scholarship from the Folds of Honor Foundation, a national organization that cares for the families of veterans who have killed or disabled. The silvery purple lining is that Shelby, who arrived with her dad, mom Glenda and grandmother Janice Speaks on Thursday, intends to become a nurse for Veterans Affairs. 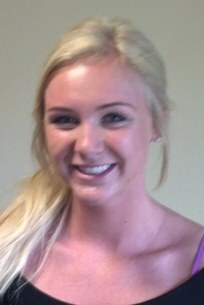 In June, Shelby and her family learned of the $5,000 scholarship that will supplement a larger academic award. One of the coolest scenes at Sedona was when the basketball players ran across the street to greet Grace Linamen, who was born with spina bifida and has been wheelchair-bound her whole life. When Jerome Garrison found out she’s majoring in communications, he started an impromptu “interview” with her and made sure she has his cell number in case she ever needs anything. 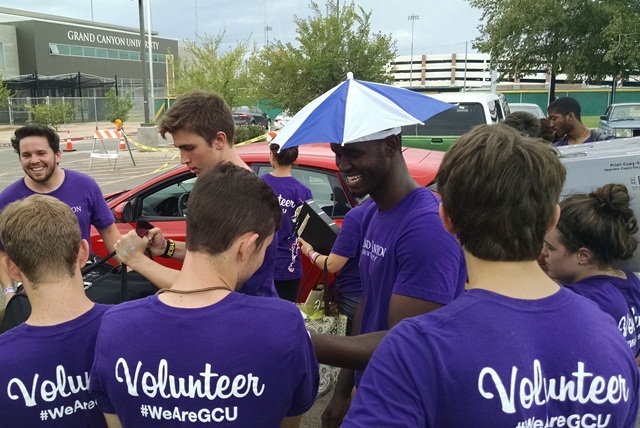 GCU junior Bikonzi Moise was ready for anything — rain or sun — at Thursday’s Move-In. The dark desert storm clouds rolled in Thursday morning, but there wasn’t much more than a slight drizzle by midday. GCU junior Bikonzi Moise, 21, prepared for his day as a volunteer team leader with a hat that doubled as a shade and umbrella. He wasn’t sure what Mother Nature had planned for his group of volunteer Servant Scholars who were greeting incoming students at Canyon and Hegel halls. Members of GCU’s baseball team had an impressive record of unpacking cars on Thursday. It seemed the steady stream of vehicles bringing in literally tons of students’ clothes, bedding, appliances, food and other goods were unloaded just like that (finger snap). People said so, and we sort of believed it, but we decided on Thursday to time two luggage-lugger teams at Sedona Hall — six women from the GCU Marketing Department and eight GCU baseball players. Enthusiasm and efficiency were demonstrated by volunteers from the Marketing Department. The mighty staffers — Emma Peterson, Jessica Richardson, Cassie Calvert, Darci Hansell, Leigh Recker and Carrie Holstein — took a bit longer (does the time really matter?) unloading the family car of Brooke Beckwith of Palmdale, Calif. But their positive attitude and huge smiles made up for it. “At least it’s only five floors, not like eight or nine,” said Richardson, loading up for another stairwell trip. 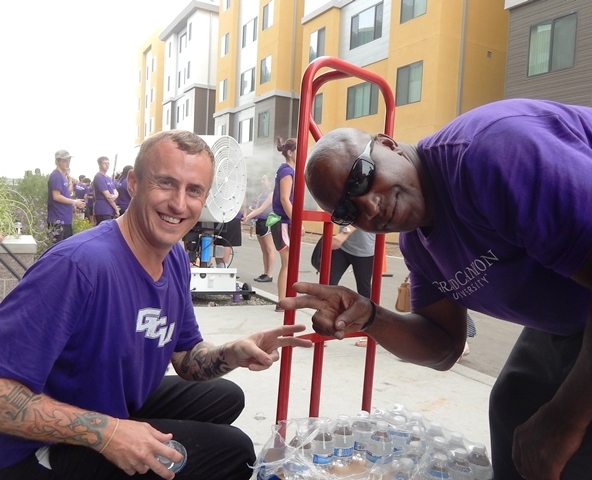 A crew of 20 men and women who are recovering from various addictions through the Phoenix social service agency Start Living helped Move-In run smoothly by stocking water-bottle stations and performing other tasks on campus. Josh Childress (left) and Melvin McGee of Start Living were on water duty Thursday. John Wilson, Melvin McGee and Josh Childress arrived at 3 a.m. Wednesday and Thursday (and they’ll be back on Friday). They’re gaining job experience, being integrated into the community and sharing valuable moral support. “This gives us hope,” McGee said. 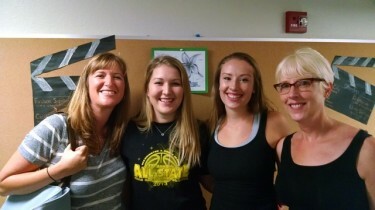 The Hegel Hall check-in was doubly bittersweet for moms Lisa Meyer and Kristin Wake, whose daughters went to high school together in Seattle and now share the same residence hall at GCU. Hailey Meyer and Olivia Wake arrived in the same minivan, with Hailey’s dad excitedly honking the horn and getting the Luggage Luggers riled up. The pair played volleyball together in high school and checked into their new home together. Making the move to GCU from Seattle were (from left) Lisa Meyer and her daughter Hailey and Olivia Wake with her mom, Kristin. 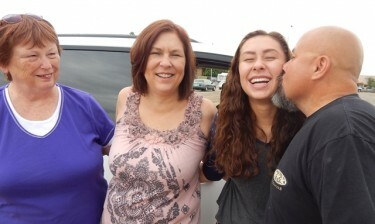 Kristin Wake said she’d already seen one daughter off to college, but that was in Seattle. 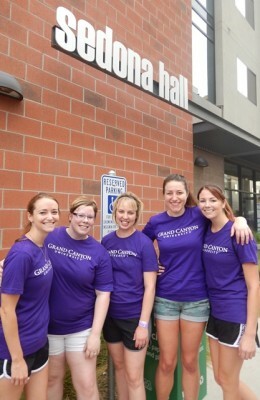 So the big GCU Move-In experience was a thrill. “I’m just really excited for (Hailey),” said Lisa Meyer, whose family had learned about GCU through their Lutheran high school community in West Seattle. California dreamin’ has given way to GCU screamin’. It’s far from unusual anymore to see cars at Move-In with California license plates, and Day 2 featured plenty more. By Friday, 1,834 students from California will have moved onto campus. Kimmy Curtis (at left with her mom, Pamela) arrived Thursday at GCU from Spring Valley, Calif.
One such California resident who came east is Kimmy Curtis, who said she’ll feel right at home here as one of seven students from her high school, Steele Canyon in Spring Valley, Calif., near San Diego. A sports medicine major who hopes to work for a National Football League team someday (“I love football”), Curtis visited GCU last December and quickly decided that she didn’t need to look at any other universities. “Once I set foot on campus, I was in love,” she said. Her mother, Pamela, loved the reception the family got as they drove in but was equally blown away by the treatment Kimmy got from GCU rep Steve Thomas during the admissions process. Yorba Linda gal Makenna Austin is a new Lope. Makenna Austin of Yorba Linda, Calif., in Orange County, had a similar experience during her visit. “Everyone was so nice,” she said. But a friend’s experience was what really made an impression on the marketing major. It’s all part of being a University dedicated to service. Last year, there were only a handful of blaring speakers around campus for Move-In’s musical soundtrack. This year, an estimated 40 speakers cover just about every corner of campus. The music and informational announcements were prerecorded by GCU’s faith-based marketing team through a station based in Phoenix that’s produced in Nashville, Tenn. Announcements and music tracks, both Christian and mainstream, are set up in audio files and customized in playlists for the GCU community. Music ranges from Christian artists such as Andy Mineo and MercyMe to pop artists such as One Direction. Bret Ceren of GCU’s faith-based marketing team said the University plans to roll out a permanent digital campus radio station, based in the Commuter Lounge, this fall in conjunction with the College of Fine Arts and Production. 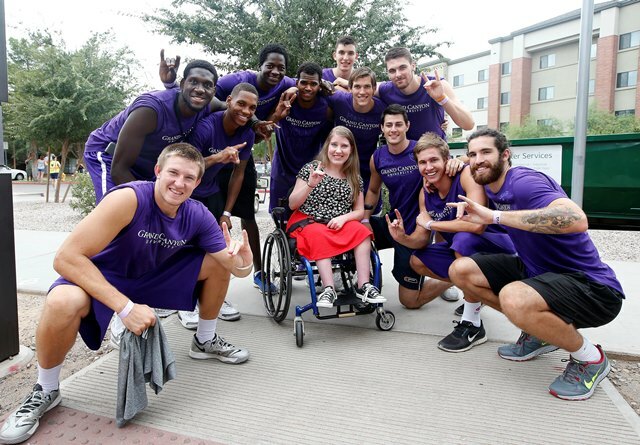 To see a slideshow of Thursday’s work by GCU photographer Darryl Webb click here.